Hi! My name is Adriana, I’m originally from Romania, but living in Ireland since 2007. I am a fully trained and qualified Holistic Therapist based in Dublin, although I do travel around and sometimes you could find me up North, in Belfast. 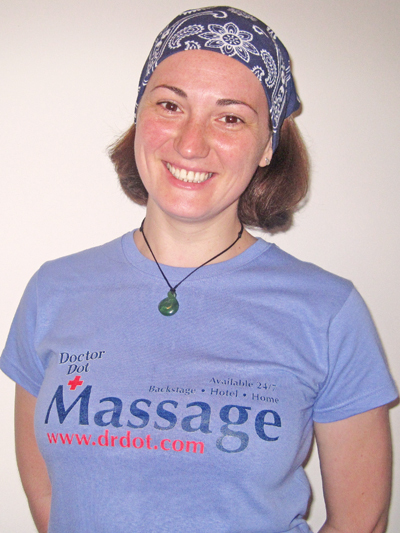 My career began in 2005 after completing a Diploma in Body Massage back in Romania. I worked in the Physiotherapy department of the County Hospital in my home town, providing Swedish Massage treatments for rehabilitation and relaxation to the patients. I also provided a Sports Massage service for the regional handball team in the National League. From 2009 to 2011 I continued my Holistic Therapy studies in Ireland, graduating in Swedish Massage, Aromatherapy, Sports Massage (Deep Tissue), On Site Chair Massage, Indian Head Massage, Infant Massage and Pregnancy & Baby Massage, all being I.T.E.C. & C.I.B.T.A.C. Qualifications. In April 2011, I volunteered as a Massage Therapist at the World Irish Dancing Championships which featured over 4500 dancers from 32 countries around the globe. Since then I had the opportunity to work with mothers-to-be, managers, physiotherapists, runners, elite swimmers, rugby players so for me, to adapt my massage techniques from pure relaxation to deep tissue massage won’t be a problem. I’m delighted to be part of Dr. Dot’s team, so if you’re around Dublin or Belfast and looking for a great massage, don’t hesitate to contact me.